Two southern states have made a strong surge in the ease of doing business in their respective territories. In the latest ‘Ease of Doing Business Reforms Ranking’ released by the Department of Industrial Policy and Promotion (DIPP) and the World Bank, Andhra Pradesh and Telangana occupy the joint top position. Gujarat, which had occupied the top spot last year, and been relegated to the third place. 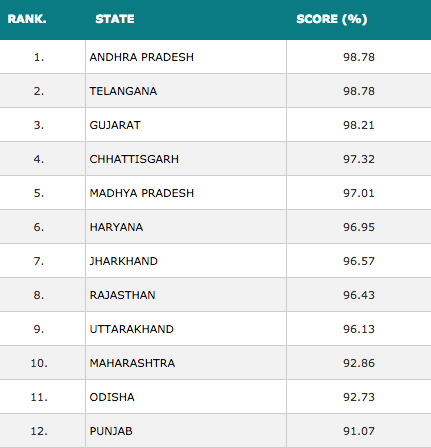 Chattisgarh and Madhya Pradesh rounded up the top 5. The assessment studies the extent to which states have implemented DIPP’s 340-point Business Reform Action Plan, in the period between July 2015 and June 2016. The Plan includes recommendations for reforms on 58 regulatory processes, policies and practices spread across 10 reform areas spanning the lifecycle of a typical business. Reform areas included areas such as Construction Permit enablers, Environmental Registration enablers, labour laws, and even ways to file taxes online. A total of 7,124 reforms were submitted by 32 states. Of these, 6,069 reforms were approved as having been implemented by the World Bank and DIPP. Overall, the implementation of reforms increased nationwide. “The national implementation average stands at 48.93%, significantly higher than last year’s national average of 32%,” a DIPP statement said. Telangana and Andhra Pradesh have both taken rapid steps to improve their governance and regulatory systems. Andhra Pradesh has a real time dashboard that tracks all activities of the state government. Telangana has also made a push to attract investments from foreign companies, and Google, Amazon, and Apple have announced new campuses in Hyderabad.